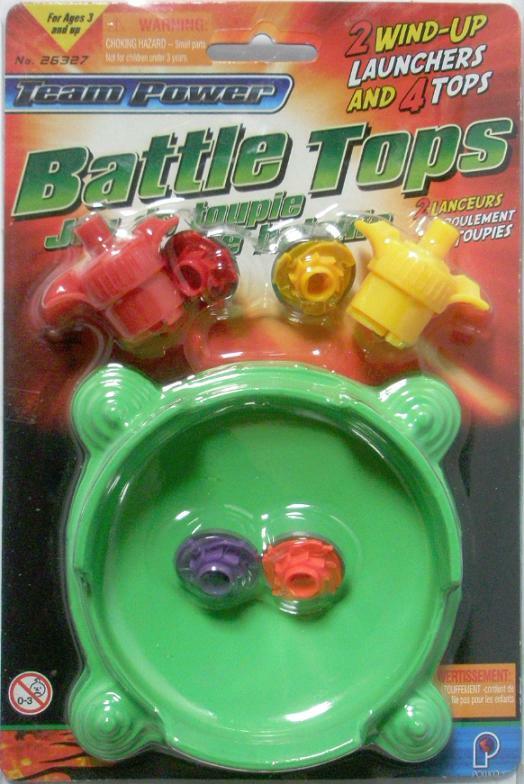 Not only have I not posted any cheap toys in a while, Battle Tops is one I have had since the very beginning. I had actually prepared a video to go along with the post a long time ago, but looking at it now I find it a little too cheesy even for what it’s about so I made a new video. Battle tops are the tops you send spinning in a little arena and then they bounce into each other until one stops or one gets knocked out of the arena leaving the remaining top the winner. Beyblades are another type of battling tops and with their edges would probably make it more interesting, but I have not tried out my dollar store cheap version of Beyblades yet. The package itself comes with a small bowl shaped arena, two launchers and 4 battling tops. What I don’t get is why there is a red launcher with two red tops and a yellow launcher with one yellow top leaving one random purple colored top. It would have made more sense to have two red and two yellow tops. Then again, maybe they ran out of yellow and wanted to make another pack. There was only one at the store so I couldn’t do any comparisons on package contents. If there was the option, I would have grabbed one that had two of each, or I could have seen whether or not I got a fluke one or the tops were just thrown in at random. It’s one of the characteristics of cheap toys. This is very old footage with poor lighting. It was taken even before the other videos and even they were taken a long time ago. I think the arena is a little too small to have decent battles. If you couldn’t watch the video, a split second of contact was usually enough to blast the top out of the arena. Then you have to crank it up in the launcher before battling again. It’s kind of like going sledding down hills in the winter time. 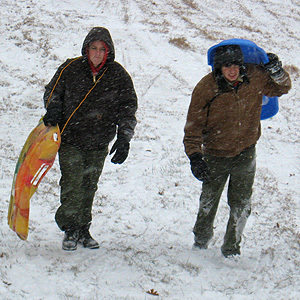 Sure, its great fun going down the hill, but it got tiresome when it came to having to climb back up the hill, with the sled in tow, in order to do it again. You have to climb the hill for couple minutes for a few seconds of sliding down.